As IGR, we are a proud member of the LMBA accreditation list since 2011, with a strong refinery, and our high technology laboratories with the sensitivity of one in a million, that passed the tests applied by the LBMA with flying colors, within a year. IGR continues to strive for perfection through developing common solutions and meeting the expectations of the environment and always aiming to be one of the best and most reputable refineries in the precious metals market worldwide. As IGR Global Co., the international trading department of Istanbul Gold Refinery, our goal has been to help spread this local service of perfection to our valuable customers all around the world. With the wind of refining and precise assaying in our laboratories under our wings, we are offering our customers high quality products and services. IGR Precious Metals DMCC are the Dubai branch of IGR Global, part of the internationally acclaimed Istanbul Gold Refinery. They provide good delivery bars and other precious metals products to retail and wholesale buyers along with private and professional investors across the world. As Dubai’s position and reputation as a gold trading hub has grown rapidly in the West, so too has that of Turkey as a gold producer, principally through it’s IGR Dubai offices. Most happy to hear of deserved winning award. IGR bullions are heart of my investment always good value and prime qualities. This team offers exactly what we need. Fast and competent were all steps from the beginning. Thank you for the past B2B and looking forward for a long-lived business relationship. Personally I prefer IGR Group ensures that the item purchased is the item received, and that the purity advertised is the purity provided. My opinion is usually gold is gold, but you should be selective. Personally I prefer IGR Group ensures that the item purchased is the item received, and that the purity advertised is the purity provided. The fairness in purity is indeed as said, previously having huge difference in purity result from the gold, but under IGR, the accuracy is very satisfied. The officer from the company is very helpful and effective with all the documentation and payment. 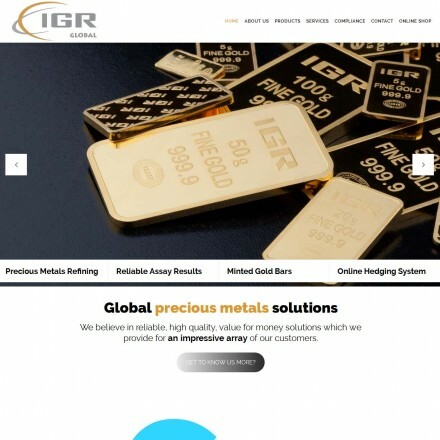 I like to work with IGR Precious Metals, they are professional with a personal touch. Thank you for your cooperation through the years. Our IGR Precious Metals reviews are powered by Bullion.Directory - The Metals Investment Portal.